“Tonight, we recognize a milestone in the history of one of Canada’s great regiments. It is my pleasure to unveil Canada Post’s commemorative envelope, celebrating The Royal Montreal Regiment’s 100th anniversary. À l’occasion du centenaire du Royal Montreal Regiment, nous célébrons par cette enveloppe les origines de ce régiment et les services qu’il a rendus. Notre programme d’enveloppes commémoratives nous permet de raconter l’histoire d’institutions locales admirées et respectées. Le Royal Montreal Regiment est l’une de ces institutions. Le RMR a des racines profondes dans cette communauté. One hundred years ago, right here in Westmount, three militia units merged to create the Royal Montreal Regiment. These militias were separated by language… Two spoke English… Une des trois unités était francophone. Les membres du régiment ont créé ensemble un régiment bilingue – ce qui était une idée assez révolutionnaire à l’époque. The merger created a bilingual regiment, which proved to be a tremendous success. Featuring archival photographs, this envelope offers evidence of that success and a glimpse into the earliest years of the Regiment. One photo from 1914 depicts members of the regiment formed up for inspection just steps from where we are tonight. Not long after, the Regiment departed for Europe and World War I. There, the regiment sharpened its skills in England and fought bravely in France where many members made the ultimate sacrifice. The stamp image on the envelope pays tribute to that sacrifice. La vignette du timbre apposé sur l’enveloppe reconnaît les sacrifices du régiment. Elle représente un monument commémoratif qui témoigne de la bravoure et du dévouement des officiers, des sous-officiers et des hommes du 14e Bataillon du Régiment. Sur cette photo, un soldat s’incline devant le monument…et aujourd’hui, nous nous inclinons aussi. Just as the stamp shows a soldier bowing respectfully at the memorial…we too pay our respects to the men and women of the Regiment who have served throughout its 100 year history. We recognize those who served in the world wars, in Korea and throughout the world on Peacekeeping missions. We thank those who served in Afghanistan. And we remember the pride and relief we felt when members of the regiment helped people in the aftermath of the 1998 Ice Storm and during the 2011 floods in the Montérégie. Nous nous souvenons de ceux qui ont servi en Corée, dans l’ancienne Yougoslavie, à Chypre et en Afghanistan pendant les conflits. Et nous remercions le Régiment qui a été d’un grand secours pendant la crise du verglas de 1998 et les inondations de 2011 en Montérégie. Cette enveloppe est notre façon de vous rendre hommage, à vous, les membres du Royal Montreal Regiment. With this envelope, we express our thanks to the Regiment for a century of service and sacrifice. The Commanding Officer of the RMR, LCol Paul Langlais, MSC, CD, ADC, thanked Mr. Morissette and Canada Post on behalf of all members of the Regimental Family and together they formally unveiled the envelope to the general public for the first time. 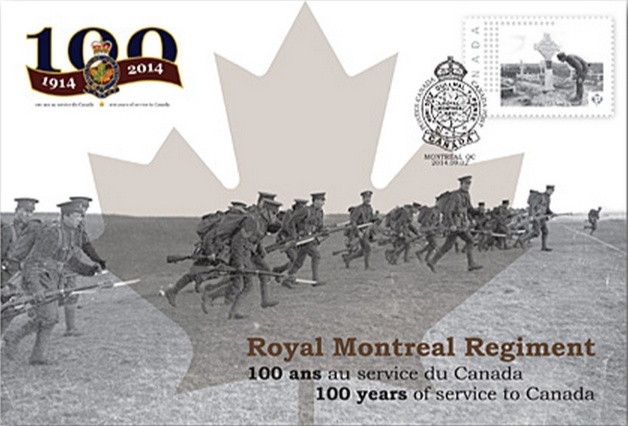 The Royal Montreal Regiment commemorative envelope was designed by Katie Deering of Canada Post, and 8,000 envelopes were printed by Lowe-Martin Group. The envelope measures 170 mm by 115 mm. The envelope’s image was taken during a training exercise in England (1915). 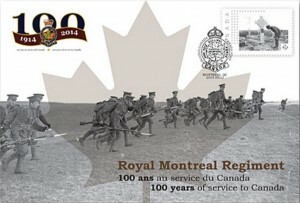 The Public Affairs branch of the Canadian Armed Forces has produced a video summarizing the ceremony held last week at the RMR where Canada Post unveiled their commemorative envelope honouring The Royal Montreal Regiment. To purchase a commemorative envelope, please visit Canada Post’s website.